Someone new is manning the kitchen at Mövenpick Hotel Mactan Island Cebu . Say hello to their new Executive Chef, Jean Louis Leon. It was a midweek lull when everyone was anxiously waiting for typhoon Mangkhut, but select members of the Cebu media were teased to look forward to exciting things to come when Chef Jean Louis whipped out his creations. Held during dinner at the indoor area of the picturesque Ibiza Beach Club, Chef Jean Louis entered the room with a smile, and introduced himself to each one who was there. While waiting for the first dish to emerge, we sampled on Ibiza’s newest drink, the frosé (frozen rosé). “Made with the perfect balance of sugar, alcohol and flavour, our frozen rosé or frosé brings you a different twist and kick to popular summer slurps from childhood years,” shared Mr. Jeryl Tio. I loved it, cos it was a pretty chic drink with a subtle kick. Born and raised in France, Chef Jean Louis has built his career through assignments in various hotels and resorts in Europe and Asia. His most recent post in a hotel in Thailand gained him recognition for various culinary offerings, which were instrumental to improving guest satisfaction within a short period of time. Mövenpick Hotel Mactan Island Cebu is his first assignment with Mövenpick Hotels & Resorts, an international hotel brand of Swiss heritage known for its 70 years of culinary excellence. The first dish was a great starter. A seafood platter which was a harmony of squid tossed with tapenade, prawns with avocado oil and citrus dressing, beet-cured salmon in mustard dill sauce and a squid ink sponge topped with edible gold foil. 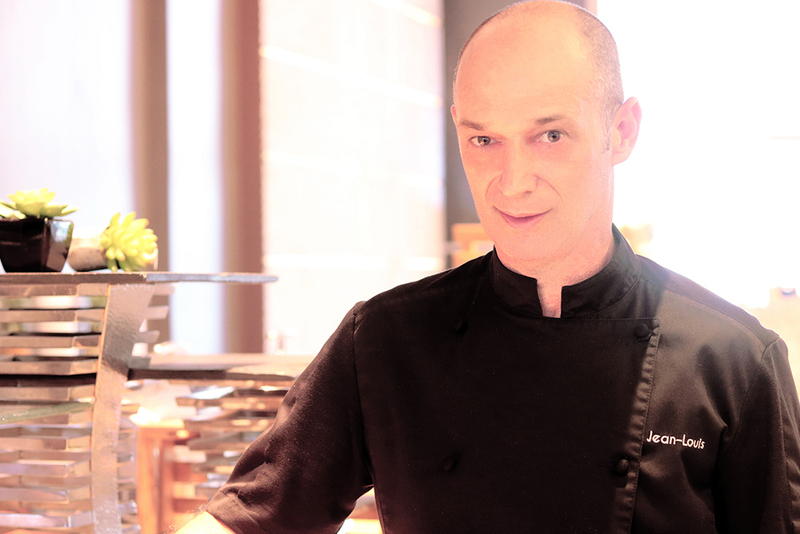 Chef Jean Louis’ shared that he microwaved the sponge and pan-seared the prawns without overcooking it. The next dish was pleasantly surprising – Bicol Express. This one was Chef Louis’ take on the popular Filipino fare. I loved how it was presented, in a cocounut shell, and just the right amount of color. The pork was very tender, and it was served with soft-boiled egg, to counter the spiciness. It was followed by the Churrasco-style Angus Rib Eye. Served with Béarnaise sauce and polenta, meat-lovers would definitely rejoice with this match made in food heaven. The beef jus emulsion enhanced with truffle oil just added more flavor. Glorious! For dessert, we had Yuzu Bavarois, which contained gelatin and whipped cream. Yuzu is a kind of citrus fruit with yellow peel found in Japan. With a flavor profile somewhere between a lemon and orange, the fruit lent itself well to the dessert served with mango coulis, raspberry and vanilla crumble, topped by an edible flower. As if the glasses of Manny O wine and frosé weren’t enough, we made our own cocktails with Ibiza’s new “Cocktail in a Box” offering, in which guests can choose from two featured boxes, complete with curated cocktail ingredients, a full bottle of spirits and mixers for you to craft your own cocktail. Each box comes with a recipe of traditional cocktails, but guests are free to get creative and be their own mixologist. What do you think? welcome to Cebu, Chef Jean Louis Leon! Schedule your next visit to Movenpick Hotel Mactan Island Cebu and Ibiza Beach Club Cebu. For reservations and inquiries, email hotel.cebu@movenpick.com or call +63 32 492 7777. For updates on special offers and events, follow @movenpickcebu and @ibizacebu on Facebook, Instagram and Twitter.